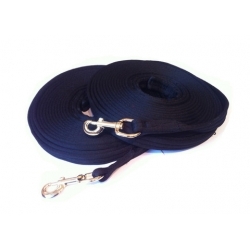 The 30ft lines are perfect for long lining and working with your horse or pony. Intelligent Horsemanship promote the use of long lining with double line work rather than single line lunging because single line lunging can cause a horse to bend against the curve of the circle and damage their spines and pelvis. Having two lines on a horse whilst working them in a circle can encourage a correct curvature of the spine, encourage forward movement around the outside of an area and keep the horse balanced and united in different gaits. Long lining can also be used outside of an arena or round pen to exercise horses coming back from injury, building up muscle, starting youngsters and general exercise for your horse. These lanky long lines are 30ft each, made from lightweight nylon "cushion web" and have a brass snap on the lead end. The buttery soft material is easy on the hands but strong. 30ft Intelligent Horsemanship lanky long lines are easy to use and excellent value for money!